Mobile drum, with strap belts for shoulder wear. Suitable for use in the field.Weight with HMA connectors 200 m cable is 15 kg. The drum is available .. Features:Holds up to: 34" and 330 lb wire reelsDurable plastic (waterproof and rustproof)Built-in carry handlesCompact interlocking pairDimensions: 17.. 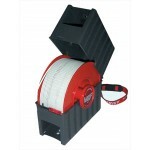 These reels are stackable for maximum transportand storage efficiency, rugged steelconstruction throughout, including square tubular frame.Two differe..
Small, lightweight and durable design for quick and easy use, ideal for applications where 200 m lengths of cable are deployed out over large areas.Fo..
Trolley drum with one-piece foot, rubber tyres and removable steel handlebars for long term shipping and storage. Large wheel diameter allows easy fie.. Heavy duty drum with direct crank rewind permanently attached to the axle. Designed for installation on military vehicle or TBD-500 typetrolley suitab..